Half-bred uncanny creatures, stalking from above and ominously spitting rivers of water as if announcing the downfall of man and the arrival of an ignote, unfathomed gloomy world. Sunday morning on your way to church. A long, long time ago. You have a sudden urge to pray. Things are not going too well lately. Mysterious deaths scamper through the city. Hundreds, perhaps thousands of people are doomed by now and nobody knows why. Is it God's wrath? Is it one of the seven plagues? Some say it comes in the air or that it dwells in the pestilent waters of the outskirts. Almighty God! What is that! A filthy rat!. Get out of my way, you abominable evil creature. I wonder why there are so many. 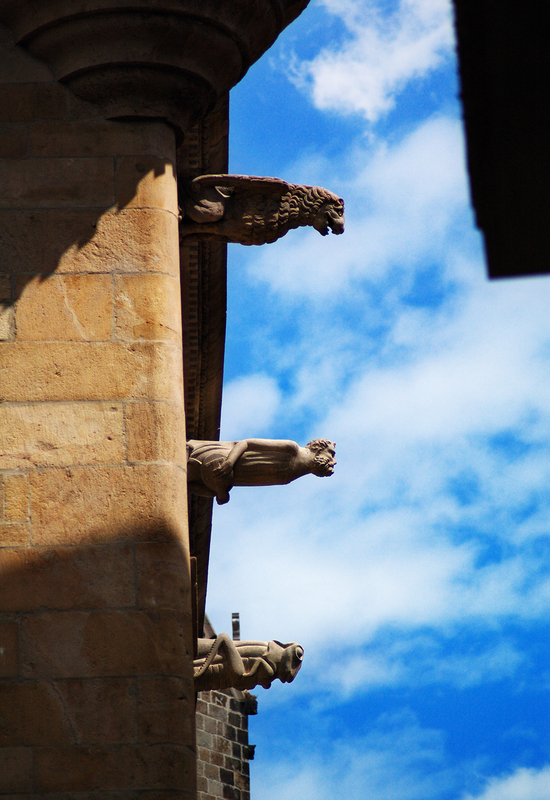 Stop looking at me, you hideous gargoyles...In 1589 1/4 of the population in Barcelona, 12.000 to 13.000 approximately, succumbed to bubonic plague (via this article in Spanish). Here is a 3D Google SketchUp of Plaça del Rei. Hi, tomorrow I am going to fly to Barcelona ;) I hope can also make some interesting photos for my blog. I wish you a nice stay. Sure you will take many. the lion, the man i have seen similar but the grasshopper is unique....thanks for posting it!